Aboriginal health standards in Australia are now so low that almost half of Aboriginal men and over a third of women die before they turn 45. Aboriginal life expectancy is more than 10 years below that of the average non-Aboriginal Australian. Number of years Aboriginal Australian males die earlier than their fellow Australians . Number of years Aboriginal Australian females die earlier than their fellow Australians . Projected life expectancy for men at birth in 2050. Same figure in 2008: 79, in 1998: 76. Projected life expectancy for women at birth in 2050. Same figure in 2008: 84, in 1998: 82. Percentage of the life expectancy gap attributed to chronic diseases such as heart disease (22%), diabetes (12%) and liver disease (11%) . 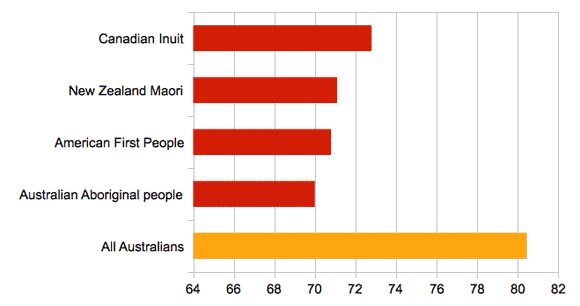 Median age of Indigenous people at death, 25 years less than for the Australian population as a whole. In some regions the median age at death is as low as 47 years. Aboriginal people can expect to die more than 10 years earlier than non-Aboriginal Australians. On average, Aboriginal males live 67.2 years, 11.5 years less than their non-Aboriginal peers, women live 72.9 years, 9.7 years less . When considering life expectancy remember that it differs regionally. While the median age at death is 57 years in New South Wales, the highest for any region in Australia, in Western Australia the median age is just below 50 years. Hence, to properly consider Aboriginal life expectancy statistics, disaggregation is necessary. According to the United Nations, the quality of life of Aboriginal people is the second worst of the planet—only China rates worse . Comparing Aboriginal life expectancy across countries is notoriously difficult. Each country has different methodologies how it counts its indigenous citizens. Australia estimates figures based on self-identification, New Zealand by ethnic group membership, the USA if people live on or near reservations, and Canada counts "Registered Indians". Consequently, it is difficult to justify drawing many conclusions regarding cross-country differences. The following comparison is based on data published by Bramley et al. in 2004 . Bramley evaluated data from 2000–2002. The average life expectancy of Australian Aboriginal people is 59.5 years and has remained steady between 1990 and 2000 . American Indians and Alaskan natives lived an average of 70.8 years over that period. Canadian Aboriginal people lived an average of 72.8 years, Maoris 71.1 years. Newer data calculated by the Australian Bureau of Statistics (ABS) yields a smaller gap between Aboriginal and non-Aboriginal life expectancies. This is because in 2008, the ABS has introduced a new method for calculation. While the underlying method to process the data remained the same, the method for accounting for under-identification of Aboriginal deaths changed. Using this new method, the average life expectancy for Aboriginal people is 70 years . 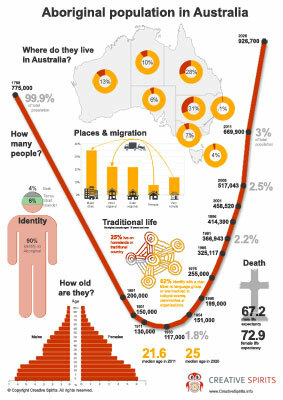 Aboriginal life expectancy. Aboriginal peoples across the world live up to 70 years, but on average Australians enjoy more than 80 years . Why live Aboriginal people shorter lives? inability of politicians to address Aboriginal problems. Population expected to live to age 65 in percent. Half as many Aboriginal Australians reach 65 as do people in Bangladesh . "Adequate primary health care services can bring about dramatic results," says former Social Justice Commissioner Tom Calma . The life expectancy of native Americans increased by about 9 years, between 1940 and 1950, after such services were provided. The life expectancy of Maori in New Zealand increased by 12 years from the 1940s to the 1960s, attributed to the same reason. While the life expectancy figures presented above are bad news by themselves, the truth might be even worse for two reasons: Statistics differ greatly between states and territories, and undertakers not always record Aboriginal descent properly. When data about Aboriginal deaths is collected from different areas and aggregated into one single figure, regional differences get lost. For proper figures, data needs to be disaggregated. Only if we consider data by each region can we consider what "needs to be done for those whose lives could improve to ensure they do not die at 30 years less than median life expectancy of Australians. When we collectivise data and highlight the overall median we fail people demographically – they become invisible," argues Gerry Georgatos, suicide prevention researcher with the Institute of Human Rights and Social Justice . According to academics, 50% of death forms filled out by undertakers don't identify if the deceased is of Aboriginal descent or not . With no accurate statistics on the number of Aboriginal people dying each year it is impossible to calculate Aboriginal life expectancy and any progress on closing the life expectancy gap. Two estimates of Aboriginal life expectancy in 2008 differed by as much as five years, providing contradictory messages on the magnitude of the life expectancy gap and rendering any mortality rate calculation unreliable . Hence the Australian Bureau of Statistics had to use a 'semi-theoretical' approach for its calculations and has done so since 1996 because census results are 'unreliable'. The 20-year life expectancy gap which was identified in 1973 might still be there, but no-one knew for sure or could tell if it has widened instead. Consequently, in May 2009, the Australian Bureau of Statistics introduced a new methodology to "better compensate for a significant undercount of Indigenous death records" . The new "experimental figures" released by the ABS show the life expectancy gap has narrowed , from 20 years previously to approximately 10 years.